I started this card for the last Impression Obsession challenge & I'm barely getting it posted before the deadline of the current challenge! For the life of me I cannot get a decent picture. Same phone, same place--no idea what's wrong. Anyway, I'm out of time & patience, so you'll have to trust me that it looks much better in person. I used one of my favorite designs for a silhouette image. Love the look of the masked, blended area. I used fairly light Distress Inks this time--blue, tan & green. The IO Solid Tree was stamped & embossed in brown powder. The challenge is to pop up your words & honestly, it's easier with larger die cuts. I do really like the Greetings Top Edgers, though, so made it work. The mat is brown, textured cardstock to match the tree. I didn't add any embellishments as this might go to a guy. Thanks so much for taking time to stop by. I'm working on getting to all your blogs--don't think I've forgotten you. I'm also entering SSS Monday & SSS Work it Wednesday. the soft cool colors blended on the background are wonderful, Greta - perfect for a guy or anyone for that matter! Oh yes, your ink blended background is so pretty! This is a fabulous card Greta! I really like the delicate sponged colours which form the background for your tree. Perfect for a Man's card or it would look great adapted for a Sympathy card IMHO. Just love the inked panel behind your tree, Greta! Just card for a guy!! Looks beautiful Greta, love the colours and can see why you like that tree. Looks great. classic elegance Greta, you do this style so well. It mever faily to confuse my why you can never get a square card to actually look square on a photo, really frustrates me. Beautiful design Greta. Sometimes with light colors you need a whole lot less light for photos to come out. And then there is the inadvertent use of a filter...I've done that with my phone. Very pretty masked blended background! I have trouble with ink blending at times...making it soft with a light touch. Yours looks perfect! Wonderful tree silhouette, too! It looks really good to me so I think it is a great photo. 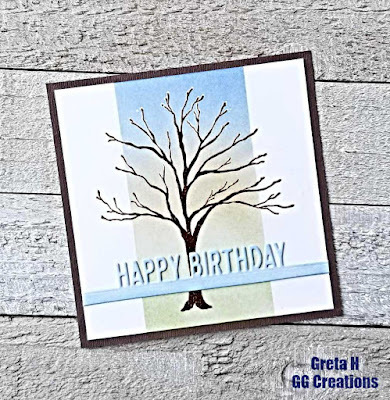 A great card design too with that wonderful tree image and it shows up so well against the soft color in the background. I like how the tree limbs extend beyond your flawless ink blending, Greta! Lovely colors and design! 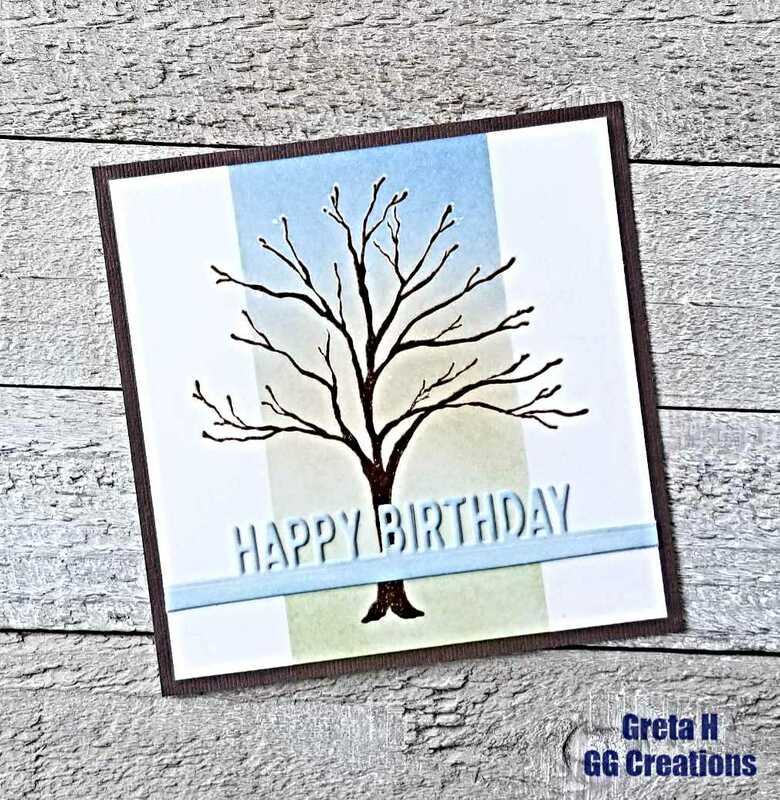 Simply gorgeous card....really love your amazing tree! This is a soft blended background and looks like an early morning sky. What a delicate tree that is and makes a lovely image. Beautiful colours and such a fabulous card my friend! Beautiful card, Greta. I love the design. Hugs, my friend. Very Pretty.. Wonderful Fall card! Such a classy card with beautiful ink blending. Photo looks good too x. Beautiful tree card! Love the blended strip! This is stunning! Such a gorgeous design with the colored strip and I love the tree. Thank you so much for sharing with us at the Simon Says Stamp Monday Challenge blog, and celebrating STAMPtember with us! It's beautiful, Greta! I love the color blocking - makes such a statement! Absolutely adore this and must save it - I love that it can be used for a fall bday but also for a more masculine take - I struggle with the latter so much, so I'll be saving this for sure!